For the London is Unreal meetup I made a presentation on the topic of plugins and chose to implement a useful plugin live during the presentation. 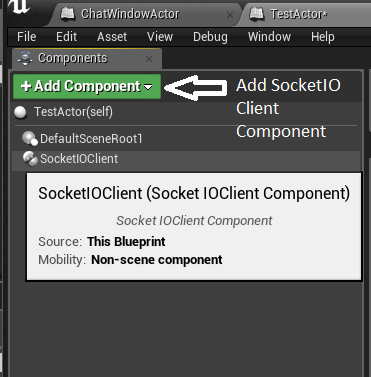 A socket.io client was chosen as the plugin, which was finished with a basic Connect, Bind, Emit functions and an On event all interfaced through an Actor Component. Since 0.4, the plugin is pretty feature complete, let me know what other features you think are missing! 4. Copy *Plugins* folder into your Project root. 5. Restart the Editor and open your project again. Plugin is now ready to use. Specify your address and port, defaults to localhost (127.0.0.1) at port 3000. Note that since 0.2.0 connect is optional as the component will auto connect unless you disable autoconnect via boolean. Call bind for each event you wish the client to subscribe, e.g. 'chat message'. If you expect to receive events, select your component and in the Details pane press the + to add an 'OnEvent' event to your event graph. Handle this event for your event types, e.g. printing 'chat message' event strings. -New optional fully plugin-scoped connections which remain even through level transitions. Tick bPluginScopedConnection true and ensure your component before and after use the same PluginScopedId. Unless disconnect is manually called these type of connections will only close on app exit. -New OnConnectionProblems callback with verbose signature allowing you to detect when you get disconnected while the socket.io client is still trying to reconnect (default: always trying infinite times). If you wish to change this behavior new parameters have been exposed which control connection attempts and delay. -New default toggle bVerboseConnectionLog allows you to quiet your log. Default is true. -Rebased to accomodate #43. You can now put FSocketIONative anywhere with your own allocation structure. -'On' event dispatch changed to 'OnEvent'. -Added C++ lambda binds do e.g. Last edited by getnamo; 08-02-2018, 06:35 AM. Last edited by getnamo; 05-14-2016, 07:10 AM. Thanks Getnamo, really enjoyed your daring live c++ coding demo - glad it wasn't me. Going to take a proper look at this next week. I'm quite interested in linking libraries so if you've got any pointers about that I'd be very interested. For now this is a basic bind, but may be extended in the future with better documentation. Enjoy! Looks like a plugin I need to add to my tutorial... That is really neat! Added some basic BP instructions to both the github readme and for convenience, this thread. Going forward the github readme will have all the most up to date documentation. Going to give this 1 a try for some User detail input for an event I have coming up, should save me some time compared to doing REST server! Any plans for updating this for 4.12? I'm currently working on a project in 4.12 and could really use this. Always nice to see someone using this ! Please do note that the current bind is functional albeit a bit simple since it was done in 30min during the presentation and could use some updates to make event binding a bit easier. Last edited by getnamo; 06-16-2016, 03:40 PM. [MENTION=548]getnamo[/MENTION] Thanks for this awesome socketio client, works well. but I am not able to use it in executable, it is working when I play in the editor, but when try to Launch as HTML5, Launch Fails. When I turn off the plugin and then launch project as HTML5, it works. Is there anything with the compilation? How to use it in executable? Please reply. The boost and socket.io static libraries that this plugin depends on have only been compiled for the Win32 and Win64 platforms. I'm unsure how plugin dependencies are handled for the ue4 html5 platform as it is not one I develop for and the documentation and questions on building with plugins are scarce and without resolution. Perhaps someone from epic would be able to chime in on what steps would be required to include static libs for the ue html5 platform? First, awesome work! And they are really clean to use from Blueprints. I do have one quick question though. I have a node server that I have been using as the backend for Unity and am looking to test it out against UE4, which there wasn't a client for socket.io when I first looked, so this is awesome! The issue I am running into is if I pass a JSON object instead of a string, I dont seem to get anything back from the plugin. Are there plans to support more advanced objects? Ok, one last issue I found, I might go look at the source and see if the 3rd party library is exposing it and it just needs to be wrapped or if it isn't there. The base library that I integrated uses sio::message as wrapper for JSON objects. This needs to take the received message object and turn it into a JSON string so you can parse it using the blueprint utility you're using. Off the top of my head I thought get_string() would do that, but apparently it strictly checks for 'string' type variables. Looking in the socket.io-client-cpp library source would be the best place to spot how. Edit: seems the library doesn't natively support message<->JSON conversion, but a workaround can be found here: https://github.com/socketio/socket.i...-cpp/issues/87. To add the workaround to the plugin would require adding that function to the component implementation and just call it if we get an empty string from our regular method. Have you tried io.sockets.emit()? This should work IMO, but it may be down to listening to the broadcast correctly. I've added the two issues here: https://github.com/getnamo/socketio-client-ue4/issues and this is the link to the underlying library: https://github.com/socketio/socket.io-client-cpp let me know what you discover! Last edited by getnamo; 07-11-2016, 10:40 AM.